If you aren’t already a follower of the “Imaginary Worlds” podcast, let me recommend it to you. 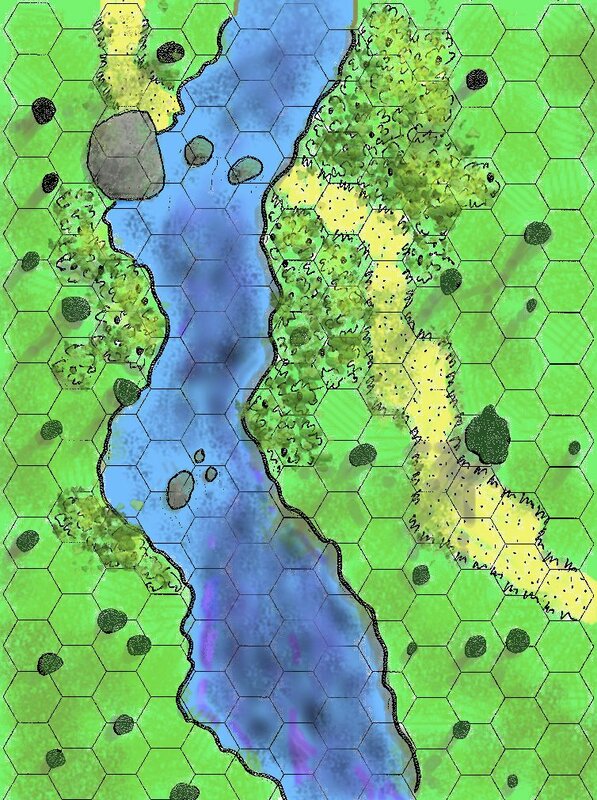 And no better place to start than the most recent episode: Fantasy Maps. J.R.R. Tolkien spent decades mapping out Middle-earth on graph paper because everything had to be invented from scratch (and given a name.) Many of his maps weren’t even published until after he died, but today’s fantasy cartographers owe a great debt to his work. They also have a post-modern understanding that to create a believable fantasy map, they have to sow doubt in the minds of readers whether we should trust the mapmakers. Let me also point out, however, if you’re already a deep map-geek like I am (and I suspect the group of people who read and follow this blog skews pretty strongly in that direction), this program isn’t full of ground-breaking, new information. But, on the other hand, if you’re in that category, you probably haven’t reached your limit on the topic, so I’m guessing you’ll find it interesting, too. It’s less than 20 minutes long. 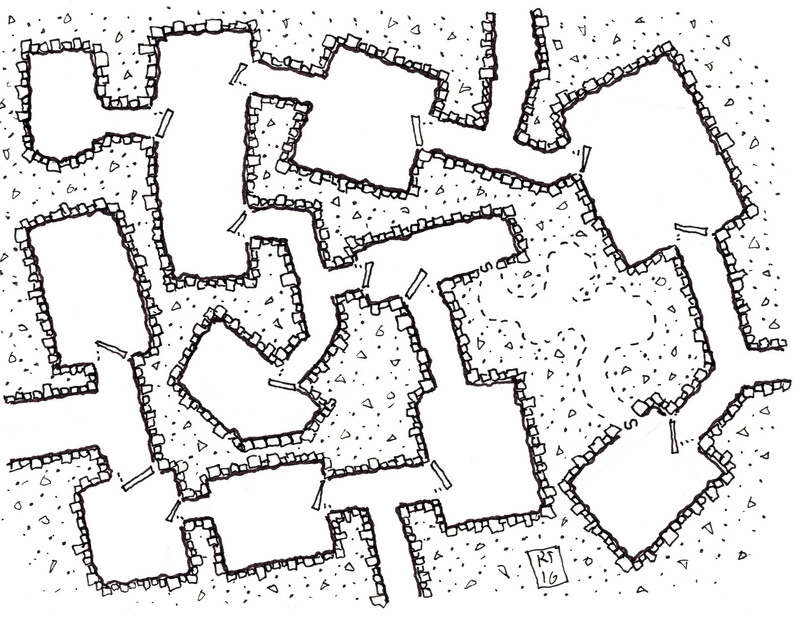 Unplanned, I swear, but the idea for this map, without thinking about where it was going to fall in the series, was to end each of the passageways and have a decision. There are just four passages in this map, one leading off each side. And each one terminates and becomes a T-intersection. Some of the rooms off those T intersections connect to other rooms, and it all gets mixed together as usual. Another tangled set of passages and spaces with a large central meeting space. There will be a complete A to Z series of these (which falls superbly well into a bi-weekly posting sequence over the course of a year). Only the last couple maps still need to be drawn; there are a few more that will be queued up shortly. Two things to think about related to these maps, now. First, is making some kind of compilation of all of them, and doing it in a way that would be useful and valuable. It can easily be combined into an ebook of PDFs. I could add a grid, or hexes, if that kind of management would make it more usable for GMs. Or I could provide some descriptions and backstory and inhabitants for each one, but these are meant to be intersections, not destinations, nor points of interest on their own. If you’d be interested in supporting this and having a Codex of Intersections, let me know how you’d like to see it extended. The second question, even though it’s still summer, is to start thinking about what the next series should be. By the time I hit intersection Z, I think I’ll be ready to be done with intersections for a while. But maybe not. Again, I’m open to suggestions and other ideas for the next series to start on.